Carlie woke up this morning. She was still getting the puckers out. Avery comes over (who had already gotten her puckers out - the worst one to wake up with puckers EVER) to say, "Good morning Carlie!" Carlie isn't talking to her or anyone else. Barely makes eye contact with anyone. Avery (who just came home from CHINA a year ago, who's SECOND language is English) says, "Carlie doesn't speak English." AND the freshly painted base boards! So pretty! Almost done in here :). Well . . . not too much to report today on the 'ole redo, but I swear the handyman guy was working ALL day. He spent the whole day prepping the floor and making marks on it so that he could do THIS tomorrow. Lay tile. This is the tile that Lori bought. It will go in tomorrow, or at least some of it will go in tomorrow because this looks like a two day project to me. But what do I know, I just take care of these kids. It's getting a little more exciting!! I'm combining two days into one. The other day he painted the walls and the cabinets. Today he hung the lights/towel rings/hooks/tp holder, and ripped up the carpet. YAY!! And YES, to those of you who are thinking it, I DO use the hot pink exercise ball that we store in the tub. SO THERE! Today is our "Forever Family Day." The day we got Avery one year ago. She was very scared of us 'white' people, had an upper respiratory infection, a rash on her torso, ate only formula (she was 15 months old), spoke Chinese, was VERY well cared for (despite the infection and rash) in the orphanage, had endured open heart surgery, had never worn a diaper, and had never known what being in a family was like. She was found when she was a month old. The Chinese believe that after a mother has her baby she is to go home and stay there for one month to protect the Chi or luck of the child and family. After that one month they are able to go out. Most babies who are found are about a month old because of this tradition. Now she has two older brothers, two older sisters, a Dad, a Mom, Grandparents, Aunts, Uncles, cousins, extended family, church family, and friends that all love her and care for her. She came into our home and KNEW it was hers - she never asked for permission to fit in. She has blessed us beyond belief. And we have seen why it is called "The Miracle of Adoption." Our family's life has been stretched beyond what we could have imagined. We are part of a population known as conspicuous families. We gather with other families just like ours so that we can feel normal. We love this normal! 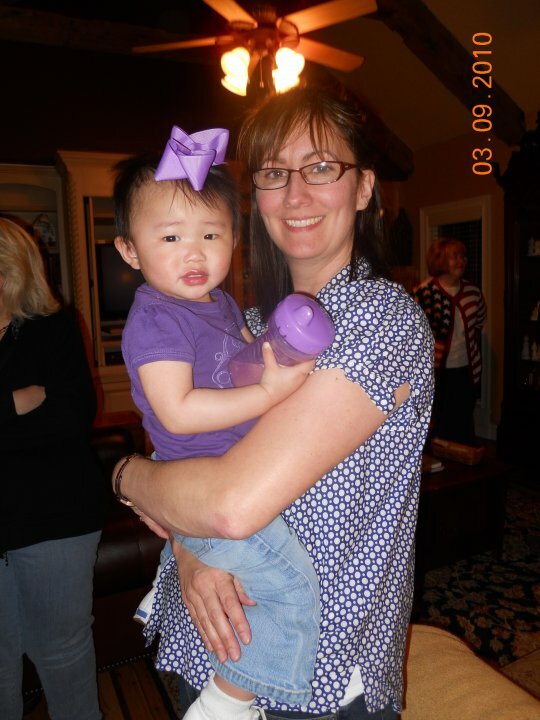 Tonight when we said our prayers, we prayed for the nannies who loved her so much in the orphanage. We also prayed for her birth mother and birth father. My heart hurts for them so much. I want so bad for them to know that she is healthy, happy, loved, ornery, and such a blessing to us. I want them to have peace. God can do this. We are so glad that we have been on this amazing ride. We would not have missed this for anything! A little color does WONDERS! Well, don't get too excited, it's just primer. But still . . . So all "we" have left to do is paint the walls, paint the cabinets, rip up the carpet (who puts carpet in a bathroom??? Gross!!) and put tile down, put up new light fixtures, towel rings, and accessorize. WHEW!!! I'm not quite sure what to do about the windows. Just the 2" horizontal blinds? Hmmmm . . . gonna have to think on that one. It's hard to tell, but here's what the troweling texture stuff looks like on the bathroom walls. Tomorrow the paint goes on!! This may be boring. OK, it IS boring. But it just brings us one more day closer to the finished product! Today our handyman guy primed the walls. See I told you it was boring. Tomorrow he will put a troweling texture on the walls. WOO HOO! I know . . . you are waiting for an update on the master bath room. That's coming, I promise. However, we interrupt this regularly scheduled programming on home improvement to bring you this special report . . .
Somebody (who shall remain nameless) (who's name starts with an E) got ahold of a pair of scissors while the mom (who also shall remain nameless, who isn't me) was on an important phone call. This E person cut his hair. He informed me that he saw it (the hair) fall on the ground (which he knew was not in his best interest because the mom might make him clean it up), so he decided to finish the self-given hair cut over the trash can (I've taught him well). After the hair cut that he gave himself we had to go for emergency hair cutting surgery at Super C*ts. E wants to know how they are going to fix his hair. He wants them to glue his cut hair back to his head. Unfortunately that is only possible in the Tyra world. There were lots of tears. He wore a hat to church. He's talking about paying a dollar so he can wear a hat to school tomorrow (not gonna happen). Or I'm sure he may come up trying to be sick in the morning. Either way, he's still just as cute as ever! My friends (who are twins, but shall remain nameless) think it is just hilarious that this happened because I have two more right behind him. HA HA! They are sooooo funny! Our house was built in 1994. We've redone all the rooms except this one. This one had this lovely Jacobean wallpaper - very busy, and very dark. This is after our 'handyman guy' had sealed the seams on the paper, cuz the stuff is GLUED to the walls and it ain't coming down except in teeny tiny pieces. And I don't got time for teeny tiny pieces. Isn't it lovely? Just a piece of artwork, right? It's so . . . so . . . 1994. Tomorrow I will tackle massive loads of laundry. Towels, socks, jeans, shirts, and sheets will be run through my high capacity/high efficiency washer and dryer. I'm not complaining . . . Thank you God for laundry. It means we have clothes to wear. This is Carlie Grace or, as she calls herself, Cawlie Gwace. She is a little spitfire. This morning she came to me and said, "Mom, did you see what Jazzy did?" I said, "No, what did Jazzy do?" She said, "She ate my cereal!" I ask, "How did she GET your cereal?" Carlie says, "I frew it on da gwound." What a beautiful morning for a Christmas Parade! The Saturday before Thanksgiving (yeah, I'm a tad behind :) our children's choir paraded our beautiful selves down main street in Jenks. We passed out fliers for our upcoming church events. Waved our little hearts out. And sang our little hearts out. After the parade we went back to the church for a cast party to celebrate how hard all these kiddos had worked. We did some turkey bowling (my team won, of course) and feasted on one fabUlous cake.